Post-Grad Community's Abbi Fletcher caught up with Caitlin Monahan (MA Design Management and Cultures, LCC) to find out more about the winning pitch at The Water Fight, a recent hackathon organised by the Post-Grad Community in partnership with WaterAid and MA DMC. Caitlin's team of 6 female students, the "Bloody Marys" developed a a digital engagement mechanic to destigmatise periods on a global scale in response to one of 3 brief's from WaterAid. Their pitch began by rasising awareness of the myths and economics costs associated with menstruation that hinder female education and empowerment worldwide, before outling lining their campaign. Aiming to get 100,000 people shouting about the outrage that is global period stigmas over the course of a fortnight leading up to Menstrual Hygiene Day 2019, the Bloody Marys pitched the siting of 'Menstrual Huts' in key locations in London, creating 360-degree interactive digital spaces for participants to learn about the stigmas women face gloabally whilst menstruating. Targetiing a young, tech-savvy, audience with a global mindset, motivated to support charities by friends, Bloody Marys saw the potential for their campaign to spread virally across Instagram and other platforms. 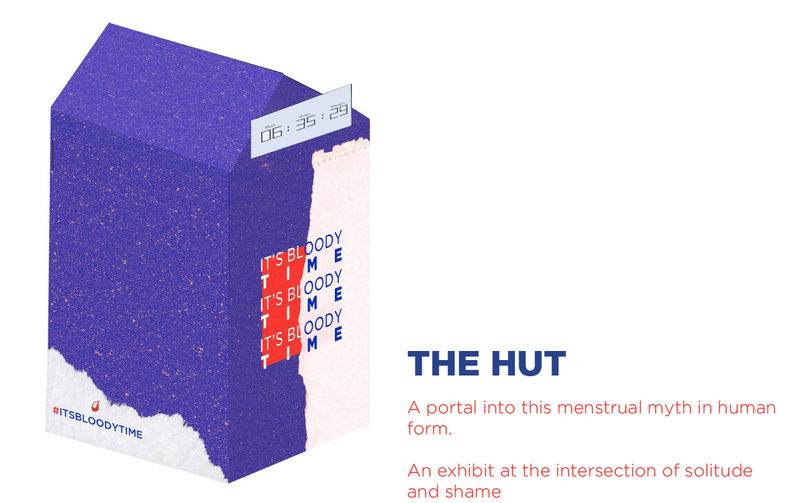 With this group most likely to engage with experiential marketing tactics, the menstrual hut would act as a portal into the menstrual myth in human form and an exhibit at the intersection of solitude and shame. Abbi Fletcher: Why did you select the period brief? 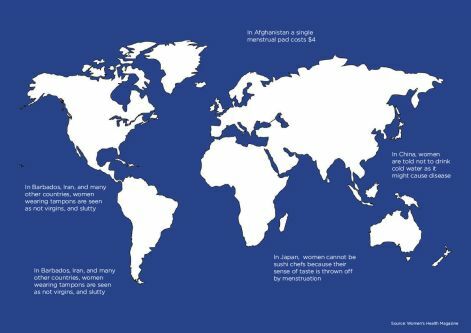 Caitlin Monahan: I am passionate about women's health and empowerment and really believe in normalizing menstruation not only on a personal level but to benefit the health and safety of women worldwide. On a personal level that might mean carrying your tampon openly on the way to the restroom without hiding it or being ashamed of its use. On a global level that means ensuring harmful stigmas can be broken down in a culturally sensitive manner. AF: What was the general thinking behind your pitch? CM: It was two fold, first, we focused on the words "relevancy" and "outrage" by creating empathy and deciding to focus on menstrual huts (the most outrageous of the stigmas in human form). Second, we wanted to understand the audience: where they are, the marketing they are susceptible to and what are their basic consumer needs. 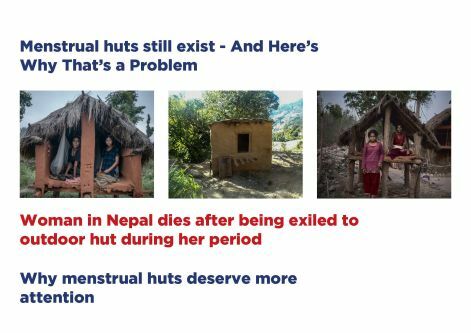 AF: Had you considered the problems associated with periods for those without access to toilets? CM: We looked at a lot of different products and angles that might combat access issues as 1 in 3 women don't have a toilet while menstruating. We considered what not having a toilet or products would look like in London, for example thinking of guerilla type style awareness campaign capturing activists walking around with red stained bottoms. But ultimately, we wanted to create a solution that would allow the audience to interact with the campaign creating a greater sense of empathy. Thanks to Caitlin Monahan and the rest of winning team, UAL MA students: Lina Alsebai; Mathilda Della Torre; Mehak Philip; Yi Xu and Yolanda Yong. Postgraduate students across UAL gathered to take part in a two-day Hackathon, visiting WaterAids headquarters for talks and challenges delivered by WaterAid; an international development charity working in 34 countries across the world, working to transform millions of lives every year by improving access to clean water. The Hackathon explored the potential of the arts as a means to achieve development goals, asking how and in what way the arts can best be used as a tool in the mission to make clean water, decent toilets and good hygiene normal for everyone, and ultimately build stronger, more sustainable communities. Over the two days, 50 students worked in transdisciplinary teams to solve the problem proposed by WaterAid, starting at their HQ in Vauxhall. From here, each team developed ideas into prototype artworks, objects, inventions or interfaces that harness WaterAids mission. The 2-day event provided an insight into the creative processes at WaterAid and how UAL students can help implement their mission to achieve lasting development goals.